This update to QSP enhances and modifies how service types are used throughout QSP. Read the in-depth details of how it can work for you. Whether you are vendored for SLS, ILS, Residential, CIT, ABA, FHA, PA or anything in between, creating and configuring your agency’s applicable service types begins in QSP’s application settings. These instructions will teach you how to setup your vendored services in QSP so they serve you properly. Begin by going to Utilities -> Application Settings and select “Custom Service Types”. 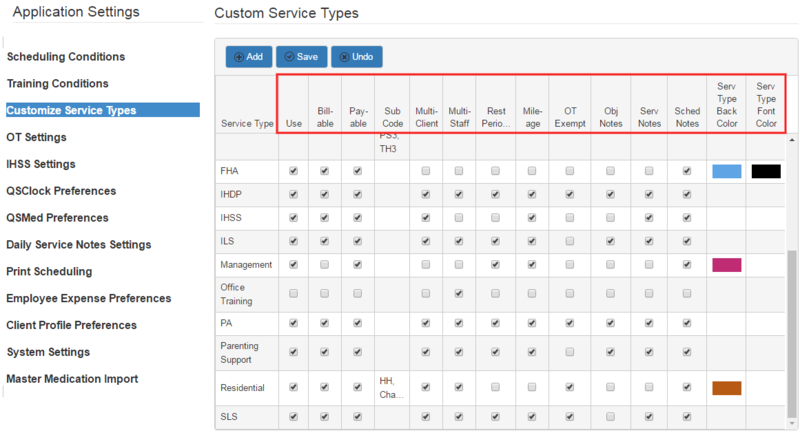 This is where you can configure the attributes for current and additional service types. Here’s a breakdown of each configurable option per service type. Payable – When enabled for a service type, the service type becomes an available option in the employee profile where it can be further configured with a Rate of Pay, etc. It also enables shifts that use this service type to be assigned to an employee. Sub Code – This is an editable text field. Sub Codes can be assigned to a primary service type, and are then further configurable in a client’s profile. In the scheduler, sub codes behave like sub-service types, available when their primary service type is chosen. Obj Notes – When enabled, there’s an option within the service type-specific shift to add ISP objective service notes. The ISP objectives must first be configured in the client profile. Serv Type Back Color – Choose the background color of the service type when it is used in the scheduler. Serv Type Font Color – Choose the font color that will be applied over the chosen background color. It’s recommended that these contrast, so the font stands out apart from the background. Exceptions – These default shift color scenarios will override the applicable service type color configurations: When a shift is unassigned (to either an employee or client) the shift color will be red. When a shift contains linked clients, the shift color will be gray. To add or update a service for a client, visit their POS tab in the client profile and notice the ‘Client Service Types, Rates and POS Details” grid. To create a new service select “Add”, and the Service Type Details will open up. From here, all service types that have been labeled as “Billable” in the Custom Service Type application settings will display. Select the appropriate service type from the Service Type drop down menu, and input any other applicable data as necessary. 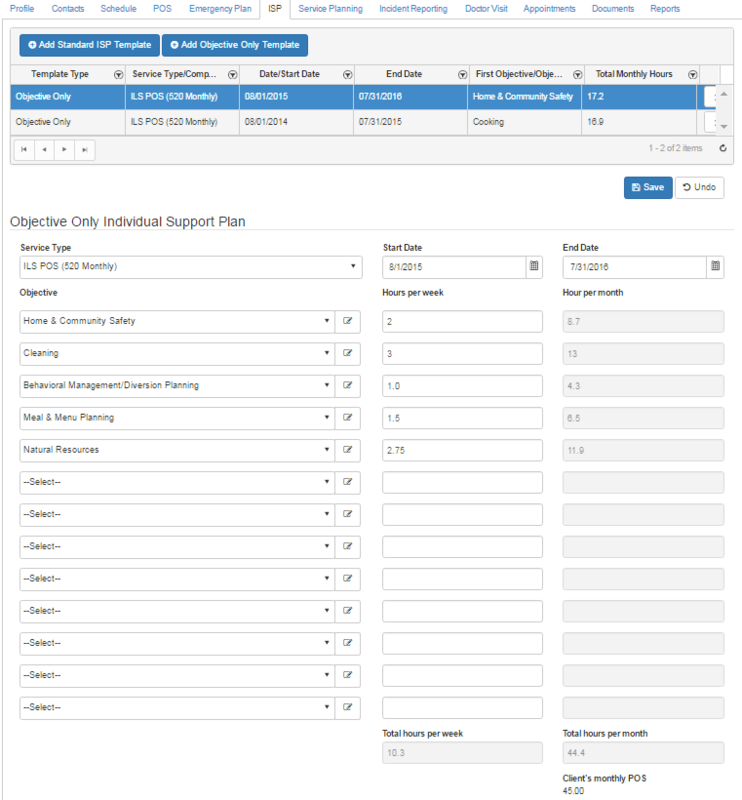 Select “Can Schedule” if this service type is to be an active and available service type in the Client View of their schedule. This will also activate it for display in the POS dashboard in the Client View of their schedule. If a client receives IHSS services, simply add the IHSS NOA amount and it will activate the IHSS dashboard and the IHSS service type in the Client View of their schedule. There are 2 types of ISP templates: Standard ISP Template and Objective Only Template. This explains the difference between the two, and how to get the most out of each one depending on the outcome you want to achieve. Creating a new Objective Only Template: To set this up select “Add Objective Only Template” and a new template is created. Service Type drop down: Select the applicable service type. Only service types that have been configured for “Obj Notes” will be be available. Start and End Date: The dates that are entered here activate the Objectives to display in the Scheduler within that time frame. If a shift is created after the ISP end date, the ISP objectives will not be available when adding ISP objective service notes to the shift. Objectives: There are a default list of objective options in the Objective drop down list. If you need to add a custom Objective to the drop down, select the Edit box to the right of the drop down field. This is a global tool, and adding or editing objectives here will add/edit for any other client records that use these. Hours per week/Hours per month: Hours entered here will not show up anywhere else. They are for reference and planning only. Each hour entered in the Hours per week field is then multiplied automatically by 4.33 to calculate the total Hour per month. These are then totaled at the bottom, and are displayed next to the client’s actual POS for the service type selected. 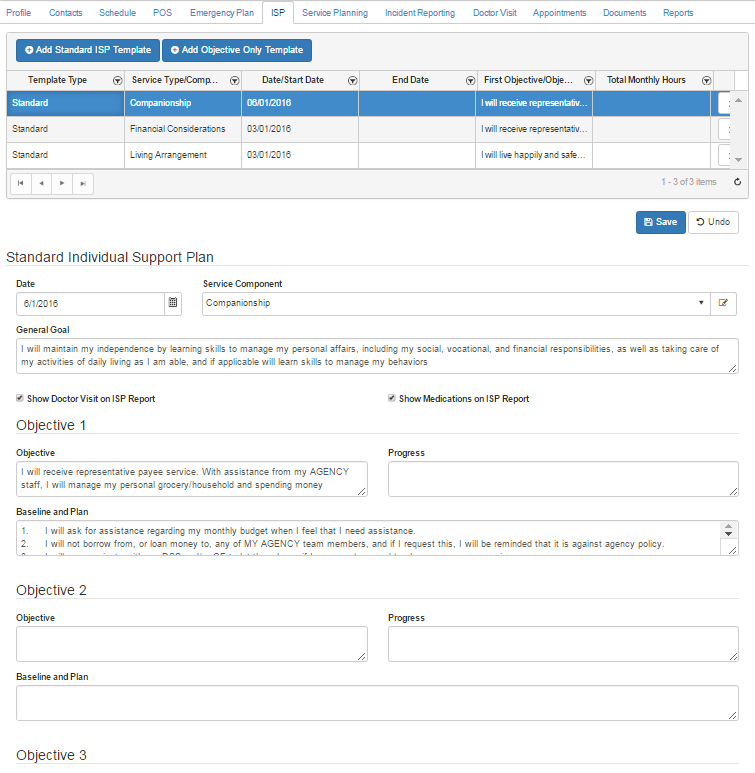 Standard ISP Template – This ISP template is not dependent on any service type configuration. It can be created as needed per ISP component. It can also be printed as an ISP Progress Report per Service Component. There is also the option to “Show Medications” and “Show Doctor Visits” on the printed ISP Progress Report” too. With this update, this step is required if you don’t already have this date entered. To add or update an employee’s base rate of pay and/or service details, visit their employee’s profile, and under the Employment Details tab, near the bottom, will be a grid section called “Employee Service Types and Rate of Pay Details”. To edit details of an existing entry, select the appropriate row and its Service Type Details will display below the grid. To add a new Service Type and/or Rate of Pay, select “Add” and Service Type Details will open up below. From you here, all service types that have been labeled as “Payable” in the Custom Service Type application settings will display. Select the appropriate service type from the drop down menu, and, if desired, add the Rate of Pay and its Last Changed date. Select “Can Schedule” if this service type is to be an active and available service type in the Employee View of their schedule. It’s important to note that assigning service rates to an employee’s profile impacts if the shifts displays in QSMobile and QSClock, if scheduled from the client view. To activate “IHSS” as a service type that’s available from the Employee View of their schedule, select the “IHSS Worker” check box located under the Employment Details tab. This checkbox also controls the display of the employee IHSS Weekly Cap dashboard, if there is a weekly IHSS cap set for the employee. Leaving our toddler years behind! It’s true! This month marks two full years in business for us! In July 2013, we sent our first brochure in the mail and made our first calls to communicate to California Service Providers who we were and our solution: QuickSolvePlus! Many of our current customers were on the receiving end then. We’ve had tremendous growth these last two years, both in our product offerings as well as our business acumen. Did you know that since our inception, over 3,500 QSP users have created over ONE MILLION shifts for over 2,500 clients?!?! Can we do 2 million? These last 12 months alone we rolled out QSMobile and QSClock for iOS and Android, as well as engineered an SLS OT tool! We all must learn to walk before we run, and we are eager to continue to earn your complete satisfaction. Thank you for a tremendous first two years! Previously, when creating an SLS-Shared shift that conflicted/overlapped with another shift with the same staff and client, there was an issue with only part of the shared shift saving, and the linked part that conflicted with the same client and staff would not save. To solve this, any time an SLS-shared shift is created and one of the clients linked to this shift conflicts with the same staff and same client already scheduled, a prompt will alert you that the shift cannot be scheduled. Below is a pic of what the issue looked like from the Worker View, only showing one client initials versus two. Client IHSS NOA History: There was an issue with entries not saving.This has been resolved. QSClock Field Staff Created Shifts: The Split and Validate process has been cleaned up to allow for variations on when data is entered in the process. Scheduler: There was an error message that users were getting when they woudl select multiple days, then unselect all but one day, and then go through the process of creating a shift. This has been resolved. Overlap and Break Reports: Shift validations for Previous and Next shifts have been added when editing a shift within these reports. Client name is now displayed in this edit shift screen as well. Check back for often for more updates!